The Lady of the Lake played a crucial role in the tale of the Great King Arthur. But what did she do when she wasn't helping the king? She did what others do, bide their time. She talked with her cousin and found a fellow whom she cared deeply for. She used magic and tried to right some wrongs. 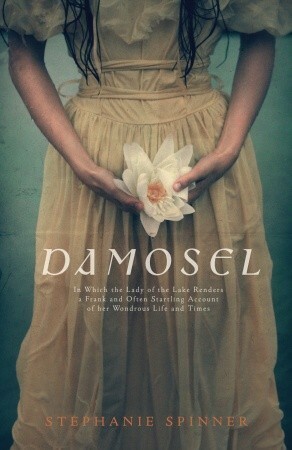 In this novel, you will get to read about The Lady of the Lake's life before and after she helped Arthur. I love retellings, and while this isn't strictly speaking a retelling, it did toy with a character that already existed in literature. I thought Stephanie Spinner did a fabulous job making this character, who played a huge role but received little face time, come to life. For being such an old soul, Damosel still had plenty of faults. She failed to accomplish things she wanted to, and broke some rules. It was very interesting learning about her down time between when she was helping king Arthur. It was great to have that timeline to work with mentally though. The handing over of the sword, the rescue of the King, Morgan Le Fay and so on. If you are an Arthurian legend fan, I highly suggest that you check this one out. "I am so well versed in The Rules Governing Ladies of the Lake that I could recite them backward on a dare, but the wisdom I treasure most was gleaned not from that vast, ancient compendium, but from my own earnest blundering. "I wondered if forthright meant 'wails like a banshee.'" I love retellings! This looks like such a cool book - thanks for the review!